It’s time for an update. 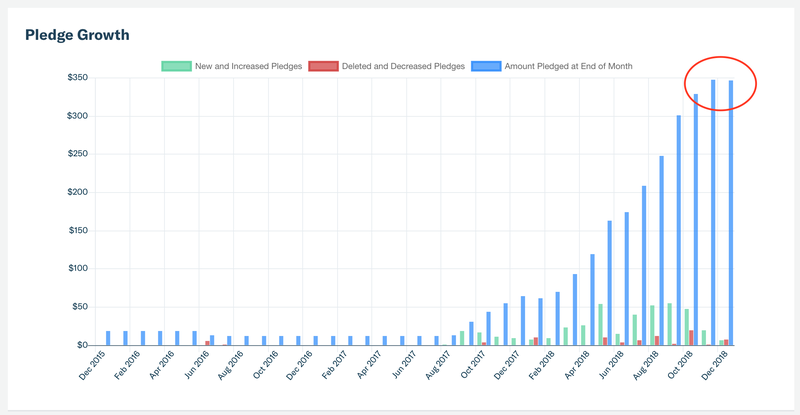 In part two of this series, we outlined a sudden spike in deleted pledges. I spoke of the scramble we were undertaking to both understand and also recover from the potential drop in monthly revenue. In the end, we overcame this hurdle and maintained a decent month-over-month growth as shown below. We added a new mystery package to our $10 tier — where we mail something to all of our $10 and up supporters twice every year. So while we skirted disaster for October, things are not looking so great for November and they’re looking downright awful for December. And that is the subject of this instalment. For the past seven weeks, we have been 150% committed to getting Alba Salix, Volume 2 out into the world. We have been at it six days a week for 12 hour shifts, at a minimum. We knew that this would have an immediate and significant impact on the time we would have for community buildings efforts. We would have zero time for anything that wasn’t post-production. So for the past seven weeks, we have not had a #FarlorianFriday and there have been no episodes of our other shows. And while we have released a much anticipated episode of Alba every Friday, there was nothing else happening or being created for our fans and supporters. In hindsight, I would have preferred to have finished all the post-production before committing to a launch date for Season 2. This would have allowed us to maintain our commitment to our community during this period. But this is now a great case study in what happens when any of us let up on our commitment to create exclusive content every week. After all, we were releasing one of the things our fans wanted most: Season 2, but it wasn’t enough. Putting out your regular show, no matter how anticipated, is not enough. 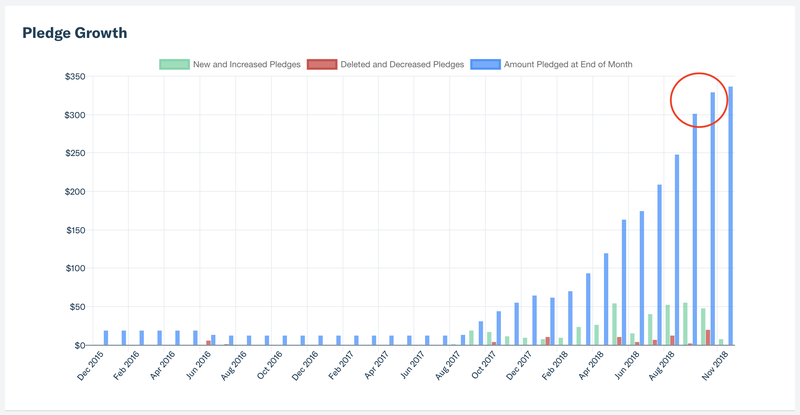 We did see some uptake on our $2 level which grants supporters early access to Alba episodes. And this did help us offset some of the churn we experience every month, but the slowing on the chart above is pretty clear. More is needed. I wish it was easier, but building a community on Patreon (or anywhere) is a full-time job in and of itself. You can’t let up, even for a minute. So this is where we are at. Things are flattening out. I do have a plan and it starts tomorrow morning, but that I will wait to speak of this until the next instalment. Right now, I want to talk about burnout. Burning the candles at both ends while also working multiple day jobs just to make our weekly release dates left us with limited emotional fortitude, let alone time to sleep and eat properly. Then add in the nerves and hesitation that comes with releasing something new into the world and you have a deadly cocktail. Burnout is real. It can cause real pain and have consequences on other vital parts of our social lives. And the more burnt out we feel, the less motivation we have to double down and create yet more content, leading to a death spiral when it comes to the dream of creating stories for a living. So, what can we do to make sure we are able to engage our fans and supporters when there is limited time or mental fortitude left? Take a break. I am the first to call hypocrisy, as I am the first one to forget to give myself time to refuel. But forcing short but contiguous breaks can actually give us the emotional fuel we need to create and engage with our fans with even more vigour. And failing that, sometimes we need to step away for an entire day. The deadlines scream at us that we can’t afford the time, but sometimes it is the only way to return with the energy and focus needed to get the work done. Build a support group. We are lucky in that our community of patrons have also become a working group of fellow creators. This was not by accident. We realized early on that so many of our supporters are also creators. And so we meet monthly on a video chat to just laugh, share and even cry. It’s the greatest thing we’ve ever been a part of. Self Affirmations. You are worthy of doing this work. What you are creating matters. And yes, you are f’ing good enough. You are not alone if you feel any insecurity. We all feel like we are an imposter. This has nothing to do with whether we are good enough to proceed. Go to the mirror and look yourself in the eyes. Do it. And tell yourself that you love yourself and believe in yourself. Because you are the only one who can tell your story. Self care. I can’t even write these words without feeling like a complete fraud. I am the worst at this. I push myself until I can’t take another step. But I am starting to be better at taking walks and stepping away. But I’d love to know YOUR strategies for self-care. How do you refuel? Please share your strategies and ways that you refuel and find the energy to return to something you are passionate about. Sean Howard is the co-creator with Eli McIlveen of Alba Salix, Royal Physician and the GM behind The End of Time and Other Bothers. He can be reached via Twitter or email.